Situated in this picturesque Peak District Village of Foolow, Lea Cottage forms part of Kirk Lea Cottage a delightful Grade II listed family home, which in recent years has been extensively rebuilt and renovated to a high standard. You enter the cottage into a large open plan lounge diner, which receives the sun all day. Two steps take you up to the light and airy handpainted kitchen, with fitted appliances and electric hobb and oven. 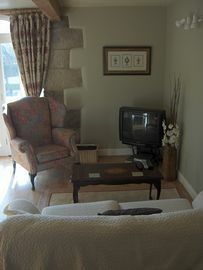 Orginial stone steps take you up the the large bedroom with vaulted ceilings and en-suite shower room. A beautiful home from home with a cosy feel. Foolow is a typical village with a traditional village duck pond, green and a local pub The Bulls Head, which features in the Good Food Guide. All of these make Lea Cottage an ideal place in which to explore the many attractions offered by the area of the Peak National Park. Walk to nearby Bretton Edge, where you can enjoy some outstanding views across the valley. Watch some gliding at nearby Hucklow Edge, or visit the plague village of Eyam. Great walks straight from the door. Beautiful village location with duck pond. All bedlinen, towels and tea towels provided. 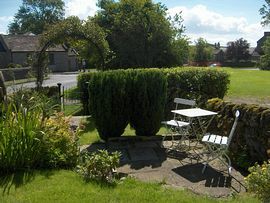 Beautiful enclosed garden with views across the village green. Courtyard storage for bicycles. Take the A617 to Chesterfield, (Follow brown signs for Chatsworth) then the A619 to Baslow and then the A623 towards Chapel-en-le-Frith, Continue straight ahead, over crossroads, straight on past EYAM turning on right. As you climb up hill Foolow is signposted next on the right. Proceed straight ahead; you should have Bulls Head in front of you. Turn Left follow the road as it bends you can see Lea Cottage straight ahead on right. 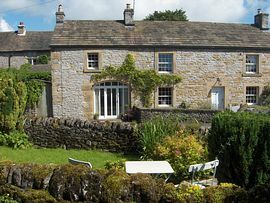 Lea Cottage is part of light coloured stone building with white gates. Parking: - Once you have unloaded there are plenty of parking places beside the duck pond, directly in front of the cottage. Take the A6 to Chapel-en-le-Frith, and then A623 direction Chesterfield. Once on A623 , stay on this road, approx 15 minutes. You will pass a large Village, Tideswell on your right. Continue straight on and Foolow turn off will appear on the left Proceed straight ahead; you should have Bulls Head in front of you. Turn Left follow the road as it bends you can see Lea Cottage straight ahead on right Lea Cottage is part of light coloured stone building with white gates. WHEN USING SAT NAV. PLEASE KEY IN EYAM AS YOUR DESTINATION -AS FOOLOW DOES NOT SHOW UP. Check in 3pm. Check out 10am. Late check out on 2 night stays.